All transactions are safe and secure with a reliable history in online purchasing behind each of our associates. 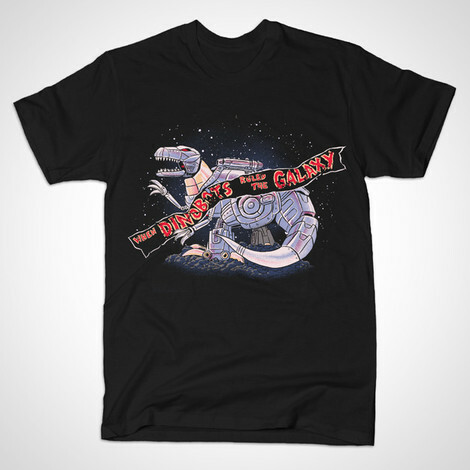 Buy the When Dinobots Ruled the Galaxy t-shirt to own Transformers clothing and merchandise. This creative Dinobots t-shirt features Grimlock with a falling banner that is similar to the one that falls at the end of Jurassic Park. Only here, it reads, "When Dinobots Ruled the Galaxy". Can you imagine the commander of the Autobots, Optimus Prime, having to save the park from Dinobots that have escaped their confinements. Pair it with black Optimus Prime t-shirts that display the animated Transformers movie theme song's chorus, "You've got the touch." Grimlock is is a popular character from the cartoon and toy line, and he looks great on this Jurassic Park Transformers t-shirt. In addition to the When Dinobots Ruled the Galaxy tee above, browse the Transformers Clothing Gallery for more apparel like men's and women's clothes, kids shirts or hoodies.